These pictures were taken one day apart...in age that is. Connor was 16 months, 14 days and Isla was 16 months, 13 days. Apparently both of them were in the mood to be cheeky monkeys normal toddlers at the same time! Both times this happened while I was in the shower. You would think I would start showering while my kids are asleep! At least I have smartened up a little since Connor was a baby and the q-tips are no longer accessible. Now the toilet paper, I am hoping to not have to remove that from an accessible level anytime soon. I'll just teach Isla that isn't cool to do. And in case you were wondering, I collected up all that tp off the ground and still used it. I am so cheap. And in case you want to walk down memory lane, her are comparisons from when they were 8 months, 5 months and wee little babes. Awwww! 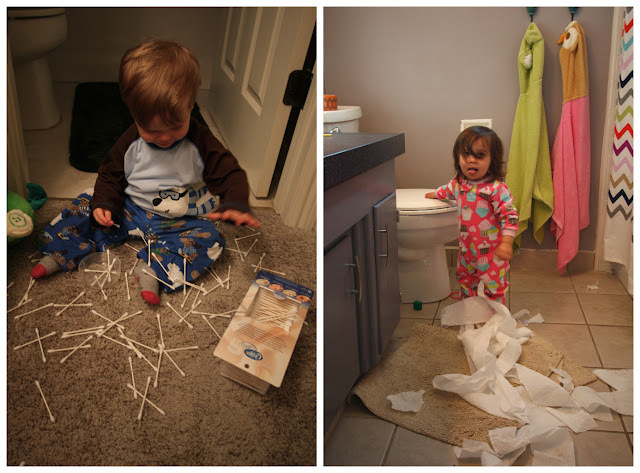 That's so funny that they made big messes around the same age. My brother dumped baby powder all over himself and looked like a little ghost. I love that you know how old they are to the day! And kinda crazy it happened so close in age! !